Group operations with map items are used when you need to correct the placement or attributes of several items of the same type simultaneously. 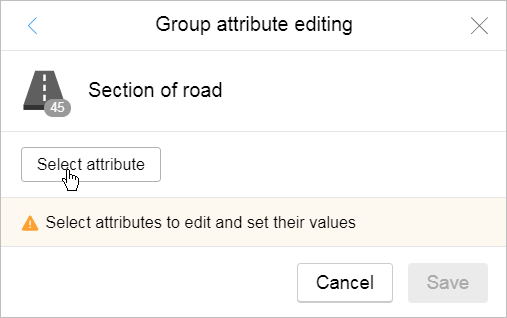 Yandex.Maps employees, experts, and moderators for the map layers in question are able to make group attribute edits. Yandex.Maps employees and moderators for the map layers in question can do group relocations. Group item relocation is used when you need to correct the placement of items after satellite images are updated, for example. Group relocation can only be used for places (Locations, Addresses, Parking lots, etc.) and simple polygonal items (Buildings, Territories, etc.). Select Group relocation in the menu that opens. (Area selection mode). In this mode, you can set an area on the map and all places and simple polygonal items that are located within the borders of that area will be selected. Regions are created in a similar way to other simple polygonal map items. (Press selection mode). In this mode, you can highlight items by clicking on them. After you've put together your list of items to move, click Move and drag the items to the appropriate place (by holding down your mouse button). Click Save. The items will be saved in their new locations. Group attribute editing is used to correct the attribute values for several items. 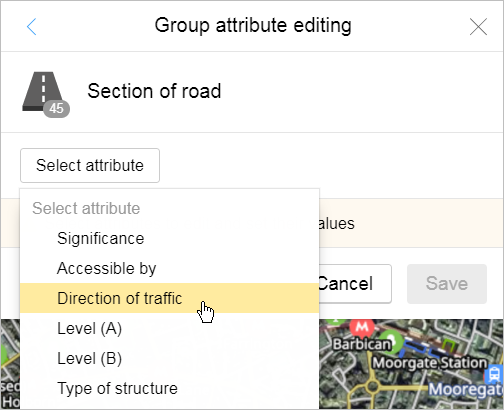 For example, you can add attributes to sections that belong to the same road, etc. 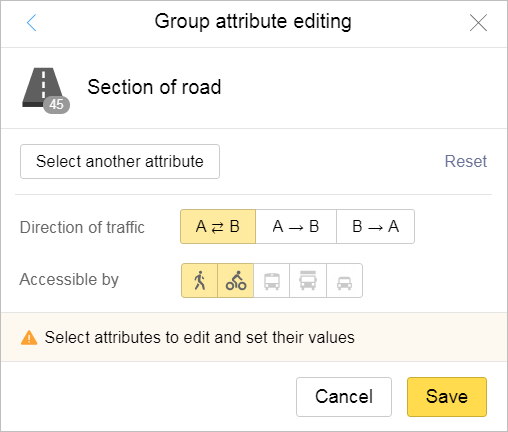 You can only use group attribute editing with buildings, sections of road, territories, and parking placemarks. Select Group attribute editing in the menu that opens. (Area selection mode). In this mode, you can set an area on the map and all the buildings, road sections, territories, and parking placemarks whose attributes can be edited in that area will be selected. Regions are created in a similar way to other simple polygonal map items. After you have put your list together, click Edit attributes. If you have to edit several attributes, repeat this process for each one. To update the attribute list, click Reset. The attribute values will be saved.